It was a crisp 58 degrees with sunny skies as I drove East from Atlanta on I-20 for a weekend getaway with my husband to Charleston, South Carolina. We had been looking for a short, driveable vacation to a place neither of us had been to for the Thanksgiving break, and had heard great things about the seaside, historic city. 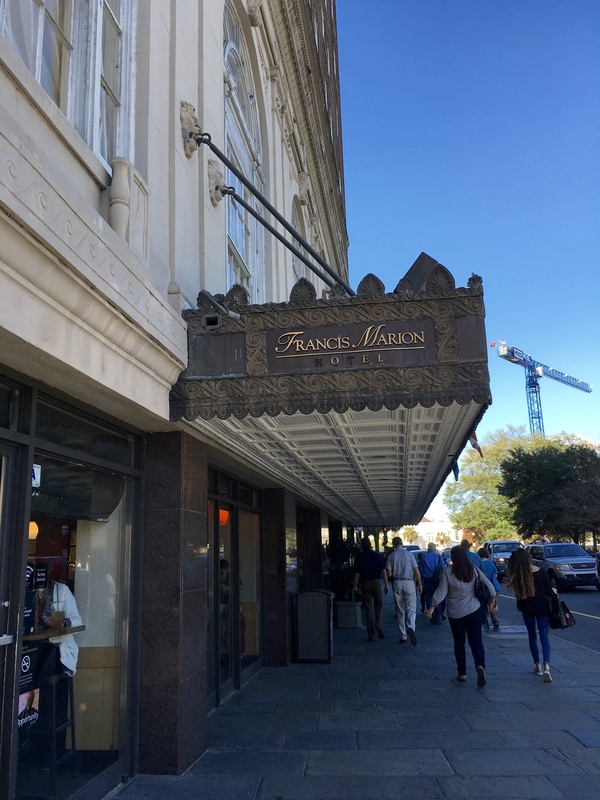 We spent four days, three nights in downtown Charleston’s Francis Marion hotel, on the corner of King Street and Calhoun. Our weekend excursion proved to be as educational as it was relaxing, as we toured the city on foot and bike. It seemed fitting to be learning about this great colonial port over a holiday that marks one of many important moments in American colonial history. Though much of our trip reinforced the topics covered in a middle school U.S. history class, there were still some interesting things about the region that I didn’t expect or recall, so here are some things that surprised me most during our stay in Charleston. Maybe it’s the fact that the city is named after King Charles II of England or that it never came up in French class as a “Francophone” region, but I did not expect Charleston to be so heavily influenced by French culture. While I can understand and appreciate that many colonial towns switched hands throughout history, I was surprised to see that to this day, people on the streets and in the restaurants spoke French and served traditional French cuisine. In the case of Charleston, both Spain and France disputed England’s claim to this seaport settlement, though the footprints left by the French are certainly more visible. For instance, on our first night in town we stopped at a brasserie, much like the ones where we ate in Paris during our honeymoon. A brasserie was explained to me in France as something in between a full-service restaurant and a quick-service cafe. Brasserie Gigi where we stopped for evening refreshments served traditional French fare like soup a l’oignon, steak frites, escargot, and duck confit. Other restaurants in the area served French favorites like boullabaisse, boeuf bourguignon, foie gras and beingets. It’s no wonder that Charleston is listed among America’s top food cities. On our second day, we got breakfast of crepes and lattes at Cafe Framboise on Market Street, where, by the way, I had one of the best mochas I’ve had in my life. I could tell the place would serve authentic French pastries and crepes when the lady at the register asked for my order with a beautiful French accent and I heard her speaking it fluently to the other woman calling orders at the pick-up counter (I’d like to note here that I was thrilled to understand everything she was saying!). We later learned on our walking tour, led by Tommy Dew, that Charleston played home to a thriving Huguenot community that continues to preserve its culture to this day. Just as the English Protestants had left the motherland seeking religious freedom, the French Huguenots, following the teachings of John Calvin (Calvinists), were persecuted under Louis XIV’s “one king, one law, one religion” rule and fled to other countries. It was no wonder then that some of the streets and sights we saw in Charleston resembled some parts of New Orleans’ French Quarter, but Dew swiftly clarified that the French who settled New Orleans were Acadians– Catholic French nationals– while the French who settled Charleston were Protestant French expatriats.Either way, as a Floridan who had learned French, I was happy to hear French being spoken SOMEwhere in the U.S.
As a port city once belonging to England, I was not surprised that Charleston had to ward off pirate attacks often. What did surprise me though was learning that the British navy actually used pirates to help them ward off attacks from ships of other countries. According to Dew, pirates were often retired British naval officers, so they had the experience and training of the navy, but without the official ties or accountability to the British armed forces. Thus, Dew said pirates filled an economic void by launching a sort of “soft war” on the ships of other countries trying to claim Charleston, without the British navy having to officially get involved. Edward Teach (“Blackbeard”) and Stede Bonnet were the two most well known pirates in the region. -Nicholas Graham, “November 22, 1718 – The Death of Blackbeard,” This Month in North Carolina History, Nov. 2003. Blackbeard was eventually killed by British Naval officers for his offenses, and Bonnet was tried and sentenced to death as well. The story goes that Bonnet pleaded to be kept alive and have his appendages cut off so he could no longet commit piracy, but he was left to hang at the harbor as a deterrant to other pirates who might have the slightest inkling to wreak havoc on Charleston’s harbor or neighborhing islands. When I took U.S. history, I got the feeling that many families in the south had slaves to help with housework or on the plantations, and that’s why the South was able to hold on to the institution of slavery for so long– I thought that with so many families having owned slaves and providing economic value, it was hard for northern abolitionist to overcome opposition from Southern slaveowners. In fact, only the extremely wealthy families owned slaves and of those, very few owned a majority of them. So the power wasn’t held so much by numerious slaveowners but by few with lots of clout. The economics of the slave trade became clear when we visited the slavery museum, which stands at the exact location of an old slave auction house within what used to be Ryan’s Mart. It was unsettling to read of how the slaves were traded, sold and purchased like one might sell trade, sell or purchase a used car today. West African tribes would capture and enslave the people of a conquered tribe, and these slaves were in turn sold to the Whites trading in West Africa. While aboard the ships, males slaves were chained together while female slaves were generally unchained unless they proved to be troublesome for the trader. Of course, many contracted diseases on the ship ride itself, but the healthy ones were permitted on deck for a few hours each day to dance and exercise so that their muscles would remain nimble and not atrophy. As they approached the northeastern ports, it was said you could smell the ship before it arrived, generally trailed by a school of sharks since casualties were simply tossed overboard. It all came down to economics. Dew said the north made money from the importation of slaves, but the South made its money from the utilization of them on the rice, cotton and indigo fields. That’s right, before the invention of the cotton gin it was rice that was the main crop for South Carolina, and in fact the knowledge, technology and skills to cultivate this was brought by the slaves from Africa according to the tour guides at Middleton Place plantation. It may be hard to picture Charleston as similar to Manhattan, but geographically there are similarities, according to Dew. Just as Manhattan has the East and Hudson rivers on either side emptying into the Atlantic and the Statue of Liberty as a monument and symbol for immigrants and tourists, Charleston is bounded by the Ashley and Cooper rivers, with Fort Sumter and Patriots Point national monuments beckoning outsiders. Even as you go up north in the peninsula, the neighborhoods of Charleston are similar to New York City’s harlem, Dew noted. So as different as these two port cities might be, they have more in common than you think. Sometimes, my own preconceived notions cause me to have certain expectations about how I might be viewed or received (an Indian-American wearing a bindi) when I think about visiting places in America’s South, but I always seem to forget to factor in one thing —Southern Hospitality. The people of Charleston are so friendly and welcoming that it made our stay enjoyable. In fact, even during out walking tour it was so interesting to hear of the Southern perspective of the Colonial period, Civil War, reconstruction, and beyond. From hotel attendants to wait staff, and shopkeepers to passersby, Charleston is full of warmth and certainly worth a visit.